Instream Energy (“Instream”) has selected Synovus Solutions to provide the control and automation solutions for its new hydrokinetic power simulator. The system, designed around a 50kW motor and drive from Schneider Electric, will allow Instream to develop and optimize control algorithms and test operating conditions and safeties built into its hydrokinetic turbine product continuously in a controlled lab environment. The Automated Test System (ATS), built using the Symplify™ platform, will offer Instream the ability to perform design validation and long-term durability testing while providing their engineering team with a detailed view of all the parameters to control and monitor the system through convenient graphs and user interface. Based on Synovus’ proven expertise with Schneider Electric motor controllers, Instream will be able to rapidly and safely control this high power test system. 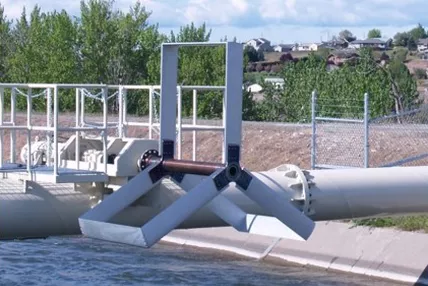 With the flexibility of the Symplify™ platform, this ATS will be easily expandable to allow Instream to test and optimize their control algorithms for specific profiles of water flows based on each project’s location and for various sizes of turbines. They will also be able to test specific conditions that would be hard to replicate in the real environment, and do so automatically in order to complete many suites of regression tests. The Symplify™ based ATS will enable Instream engineers to make system design improvements quickly and more cost-effectively.